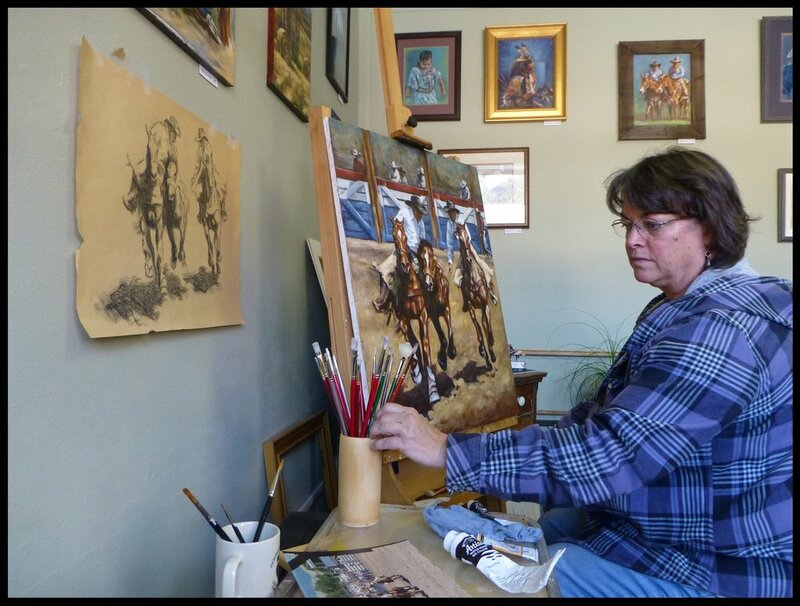 Inspired by a lifelong love of all things equine, Montana artist Sue Hummel is noted for her detailed drawings and oil paintings of horses and mules. Her interest in art began early in life as well, leading to studies in fine art and art history. After moving to Montana in 1980, Sue was fortunate to find a patient and gifted teacher in portrait artist Glen Funk. Sue honed her drawing and painting skills for several years under Glen's instruction, and discovered an affinity for portraiture. Animal or human, Sue is enamored with discovering the subtle characteristics that will bring out the unique personality of her subjects. Each piece is a challenge, and at times a struggle, but Sue always finds joy in the process and is blessed to able to do what she loves. “As a resident of western Montana for 40 years, I can't help but be inspired by our vast landscapes and colorful history. What I find most intriguing however, are the individuals who are a part of, and have been, shaped by this place. Some of those characters walk on two legs, and some gallop across the wide-open spaces on four. I find myself drawn (no pun intended) to close-ups, looking for details that will capture a mood.